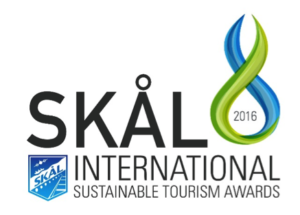 We are thrilled to announce that we have won the 2016 SKAL Sustainable Tourism award in the category of Tourism Operator. Skål International is an Affiliate Member of the UNWTO whose mission is to promote the development of responsible, sustainable and universally accessible tourism. It is an honor to win this prestigious award and be recognized by SKAL International. This award allows us to increase visibility and get recognition of our outstanding performance in terms of sustainable and responsible tourism. We are excited for this opportunity and platform to market ourselves and also to connect with other like-minded companies who share the goal of sustainable tourism.